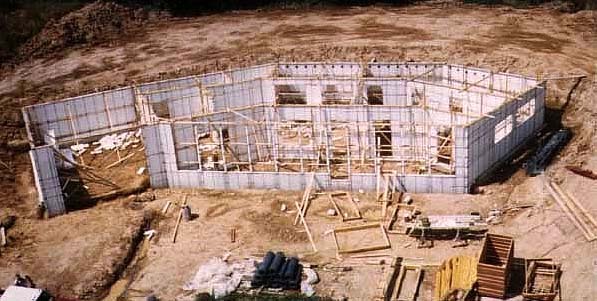 The first picture of the construction of the house given to us by the previous owner was taken in June 1980 showing the surveyor tripod and the Ferris farm house. This knoll of grass was the pasture area for the farm horses and a few cows. It had no trees and was quickly cleared by the earth grading equipment which opened the top of the hill. In the cleared area the house footers were poured and then the 2- foot deep gravel bed and piping was placed into the footer area. We did not have photos of the gravel bed piping which would be of great value. The house shell of extruded polystyrene blocks was constructed quickly (about two days). Notice the solid back wall is in three sections to form a semi-circular shape and the floor of the building is slightly above the street. Below is a shot from the air! (The builder, Ray Baker, often came to work in a helicopter). We have also received more construction photo's of the solarcrete construction which have been added as a solarcrete construction page. Actually since the location is the top of a hill, the entire house is above grade. The window wall is facing slightly SouthEast and the bedroom windows are facing almost due East. The back wall faces North and will be completely covered with earth after the concrete roof is poured and the Bentonite clay sheeting is applied. The front shell is facing south and is composed of 10 large windows and the front entrance doorway. These windows constitute 285 square feet of glazing for the 550 square foot sun room where the heat from the sun will be collected. The solid wall is facing west and is the garage wall. Notice the steel beam across the entrance. The west wall will also be completely earth covered and burmed after the concrete roof is poured and the Bentonite sheeting is applied. How quickly the house grows! 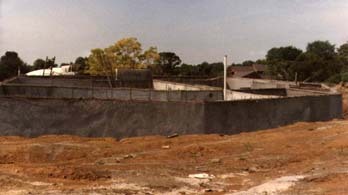 This picture shows the concrete roof has been poured and the shotcrete spay has been applied to encapsulate the polystyrene shell (this is the SOLARCRETE construction technique). Looks like a pill box bunker or bomb shelter at this point doesn't it. The roof is already poured (84 yards of re-enforced concrete in one continuous pour I was told) and the interior flooring, UltraFlo plumbing and wiring are next. The final construction shot we have shows the house complete. It is early winter (probably Thanksgiving) The house is ready for people to move in and hold landscaping the grounds till spring. Spring of 1981 shows the house with small trees and flowers blooming. A rail fence atop the grass covered roof adds the crowning touch.